Hey-O! 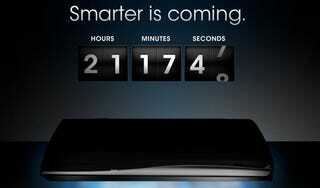 A Sony marketing countdown clock begins counting down...and the speculation ends before it begins: The site's "x10"-laden source code has revealed this to be, most likely, the upcoming Xperia x10, running Android. If the name sounds familiar, this might be why: We received one back in March, but the interface was buggy and unfinished, so we held off from "reviewing" it as some other sites did, to ensure that the final build UI could be properly reviewed in Q2.